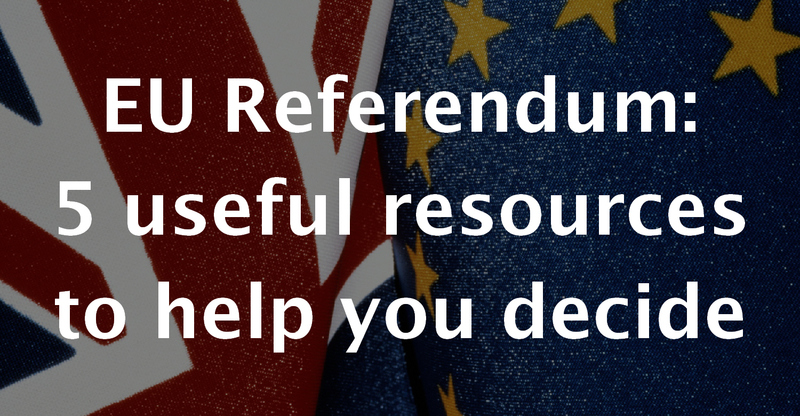 Following on from Neil’s sermon on Sunday about the EU Referendum, I’ve collected together 5 useful resources to help you think about this important decision. Evangelical Alliance have produced some helpful resources explaining how the EU works, some questions to consider in the run-up to the EU referendum, and also some useful prayer points. Christians in Politics have put together an ‘EU Focus’ page, including a quiz where you can find out how much you really know about the EU, and some useful blog posts from Christians on both sides of the EU referendum debate. Reimagining Europe is a multidisciplinary blog hosted by The Church of England and the Church of Scotland. It has two complementary streams of reflection and deliberation. First, an in focus conversation on current themes involving experts from a range of theological and political backgrounds from around the UK and Europe. Second, a more popular ‘Postcard from …’ series involving shorter one-off contributions and reflections from around Europe. It’s really important to have discussions and debates, acknowledging that we won’t agree on every issue, whether that’s in politics or in church. But we always need to make sure that we ‘put Kingdom before tribe’, and disagree well. Previous: Previous post: How should Christians decide how to vote in the EU referendum?